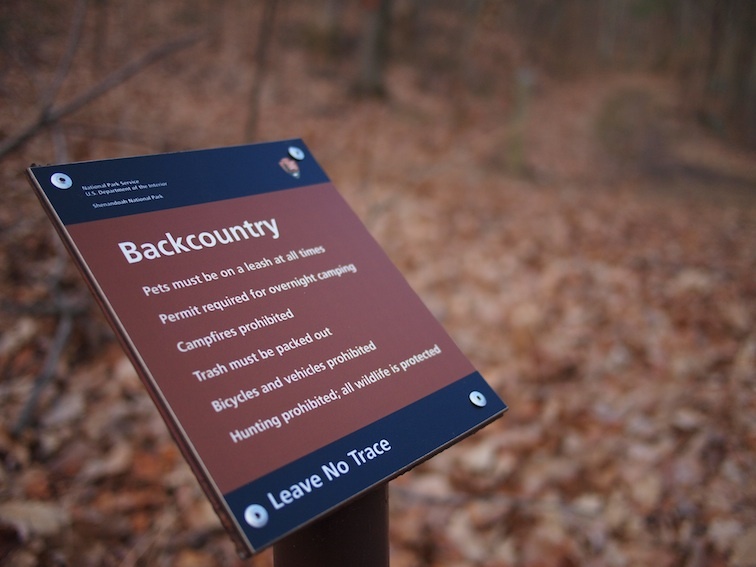 Home » Fishing Reports » Brook Trout Fishing in 2011 – It’s Time! The weather forecast for last Friday was for a warm day, into the 70s. So I started watching the temperature each day in anticipation, planning to take the day off to try to catch some brook trout in Shenandoah National Park for the first time this year. Friday’s weather ended up being similar to Thursday’s, but a little warmer and with wind gusts to 30 mph. Minus the wind, it would have been ideal. For the middle of February, it still was. No one can complain about a sunny, 70 degree day in the last few weeks of winter even if it means your rusty casting skills are going to be tested by that stiff breeze. I decided to head out around 8:00 and drive to a stream in the park that I had never fished before. Three things are unfortunate for each and every one of you who reads this. The first is that this is a stream I rarely hear mentioned, and since I’ve discovered it is a great stream, I will not name it. No stream in the park is such a big secret, though. 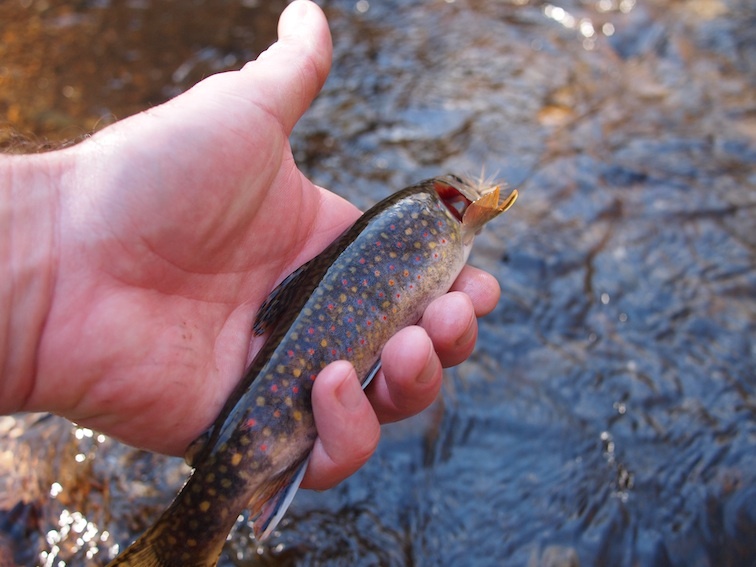 Everyone knows that just about every stream there has at least some brook trout. So get a map, find the blue lines and head out there. That’s what I do, with the occasional hint from a few books and reports found among those who do the same. I had been eying this stream on the map for a while, but without confirmation of what’s there and knowing that a poor fishing spot means an entire day “wasted” (as wasted as a bad day of hiking and fishing can be), I’ve just never checked it out. Coupled with what looked like some questionable access on the map and some roads that seemed more like suggestions, I wasn’t sure what I would be driving into. But I figured now was the time to see. Worst case was I’d be outside sunning myself in the middle of February. The second unfortunate thing for you is that you were not out there on Friday. No one was out there. Maybe you convinced yourself to save those vacation days for April and May, when the fishing is no doubt at its best in the park. Maybe you thought stiff winds smothering your casts wasn’t worth it. Maybe you figured since it’s a three day weekend, you’d head up there on Monday, the Presidents’ Day Holiday, because you know many have to work and won’t be out there trampling on your favorite spots. Whatever the reason, I saw no one all day once I got inside the park boundary. That’s not unusual, but it still amazes me. The third unfortunate thing is that you missed out on some great dry fly fishing in the afternoon. Despite the breeze, I found enough sheltered spots and enough will and technique to get a size 14 Adams where I wanted it to go most of the time. Cutting the wind with a big dry fly and having fish take it, even if they were a little slow, in FEBRUARY, 70 degrees, everyone else is at work… mana. The stream was right at 40 degrees when I got there. By the time I left it had probably hit 43, according to my very hard to read thermometer. Definitely at least 42. 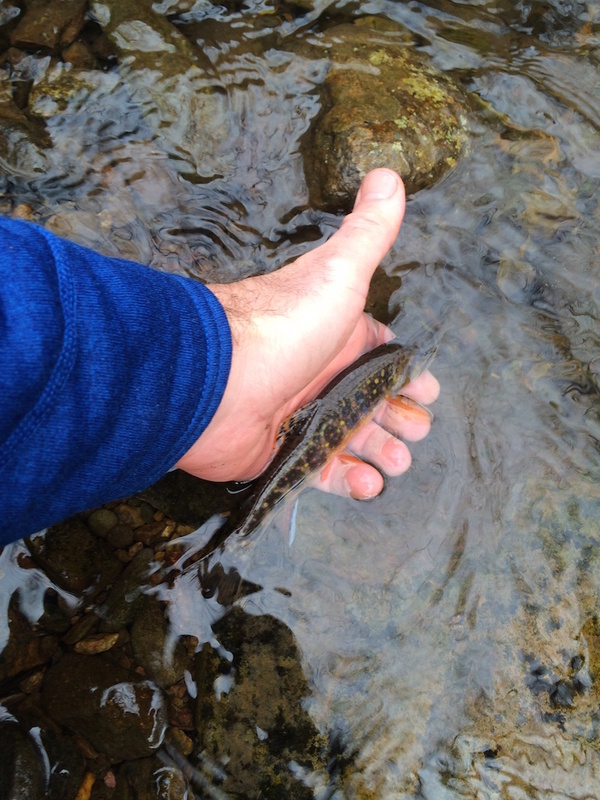 That small warm up seemed to be all it took to get the brookies hitting dry flies drifted over their snouts. 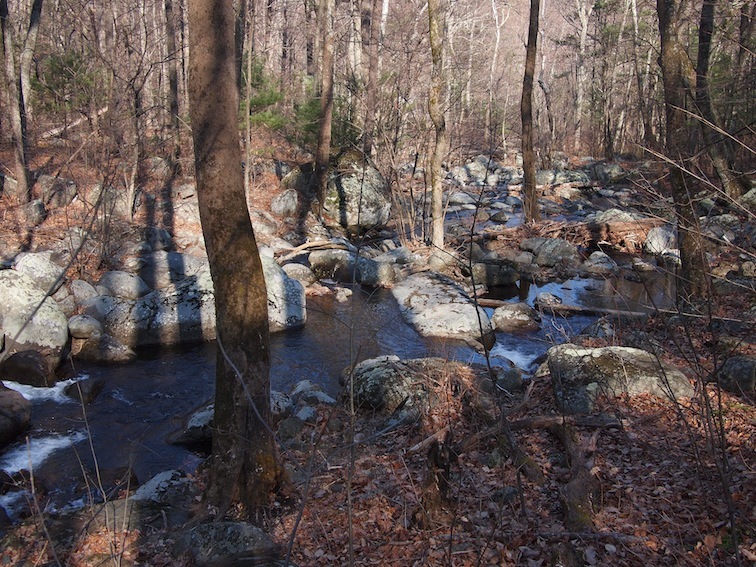 Since I wanted to explore this stream a bit, I had first walked upstream a few miles, then turned around and targeted some pools and runs that I then fished upstream in short segments. In the first several pools I had no luck. Then finally a good sized brookie hit my fly. It was a fat male still colored nicely, and as I lazily hoisted him he flipped off back into the pool. Awesome! I ended up not catching as many fish as I would in April or May, but these were all decent fish, similar to the one pictured which was the last one I caught and the slimmest. As is the case every time I fly fish, I learned or re-learned a few things. 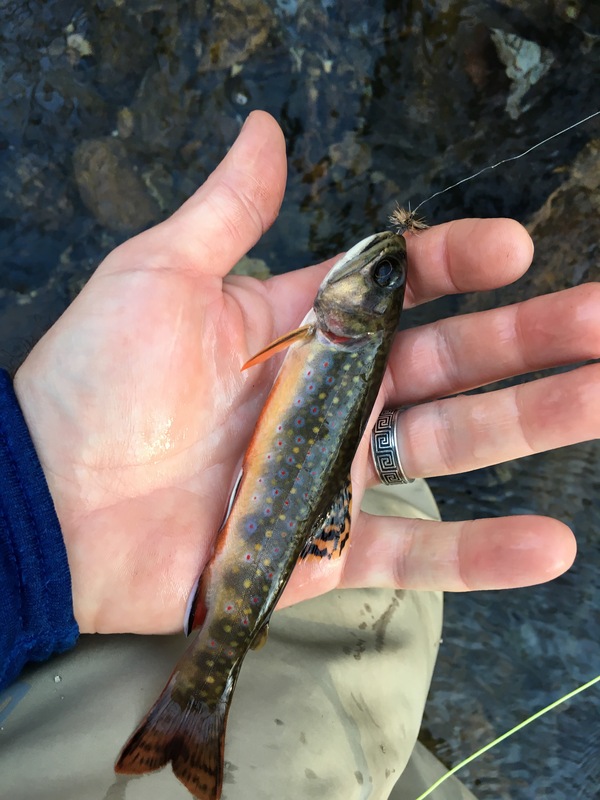 It’s been months since I’ve fished a small mountain trout stream, and I think the reason it took me a while to land the first one was impatience. I was not fishing out every pool thoroughly. On a warm winter day, it seemed even more important to give the fish a few looks at the fly rather than one or two drifts like you’d expect in the prime time of spring. The ones I caught were taken after I floated the fly by several times, and the takes were slow, not the lighting fast strikes of spring, summer and fall. The desperate little creatures must think something like this: “Man, I’m sick of winter… Hey, was that a fly floating by? Ain’t it a little early? There goes another. Didn’t realize I was hungry. And there goes — I’m snaggin’ it!” So once I slowed down and methodically fished every seam and pocket I was successful. I also tried another dry fly floatant, Gink. This stuff works really well. I treated the fly when it was bone dry, and until it was taken and slimed, all it needed was a good shake to restore its high-floating ways. I’ve got another dry fly floatant to try next time. The stuff I’ve been using most recently, Loon Aquel, is also good. I would have to try both side-by-side to really compare them. There are so many dry fly floatants and I’ve only tried a few. Most are silicone, so maybe they’re all actually the same. I don’t really know for sure. Anyway, the season is upon us. Winter is revisiting for the next few days, but spring is coming quickly. Get ready.